CBD has been proven to aid the body and mind in multiple ways. It has potential therapeutic effects over a host of neuropsychiatric disorders. 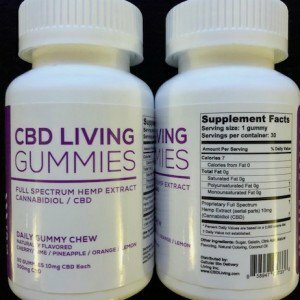 CBD Living Gummies are hand made using high quality ingredients and flavors. All CBD gummies are carefully infused with nano-sized Cannabidiol (CBD) & Vitamins (B12/D3). Normally, more than 90% of CBD compounds are lost to the body during metabolism, hindering the system from harnessing the full benefits of the compound. Using nano technology, CBD Living makes sure that their products offer 100% bioavailability and improved therapeutic effect. CBD assuages cerebral damage linked with neurodegenerative conditions. It also has anti-psychotic, anxilyotic, and anti-depressant effects. In addition to cognitive enhancement, CBD also prevents cancer cell growth and induces the elimination of cervical cancer cell lines. Great product. Tasty, and gets the job done!